Military-Grade Extended Color Vision Testing App for iPad is Now Available from iTunes® and the Apple® App Store. Konan Medical's new ColorDx Pro brings military-grade assessment of color vision deficiencies or color blindness to the iPad. 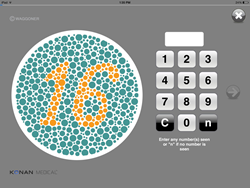 ColorDx Pro is professional-grade testing for color vision deficiencies / color blindness now available on the iPad. Konan Medical, a global leader in innovative diagnostic and examination devices for the ophthalmic industry today announced that it has released ColorDx Pro, a military-grade, extended color vision diagnostics app for iPad. ColorDx Pro is available from iTunes for an introductory price of $699.99 (USA Pricing). ColorDx is routinely used at the Naval Aerospace Medical Institute (NAMI) for qualifying Naval aviators and the FAA has recommended its use for qualifying civil aviation pilots. ColorDx has other test strategies for vocational color vision assessment that are also self-administered and automatically scored. ColorDx apps test for both genetic (protan/deutan) and acquired (tritan) color vision deficiencies and is used extensively in clinical practices to aid decision making for a variety of neurological and ocular disorders, or substance toxicities that can cause a tritan deficiency. ColorDx is also available for Android™ tablets, Windows® and Mac® computers as well as online and print. More information and free 30-day trials are available http://www.konanmedical.com/colordx . Journalists, editorial contributors, and academic institutions interested in obtaining ColorDx Pro for review purposes are invited to contact Konan Medical. About Konan Medical USA, Inc.
Headquartered in Irvine, California, Konan Medical USA Inc. develops specialized diagnostic and examination products for eye care clinicians and eye banks. The company also provides diagnostic equipment and support services to many of the leading ophthalmic manufacturers in support of sponsored FDA clinical trials research in the United States and internationally. For more information visit http://www.KonanMedical.com .